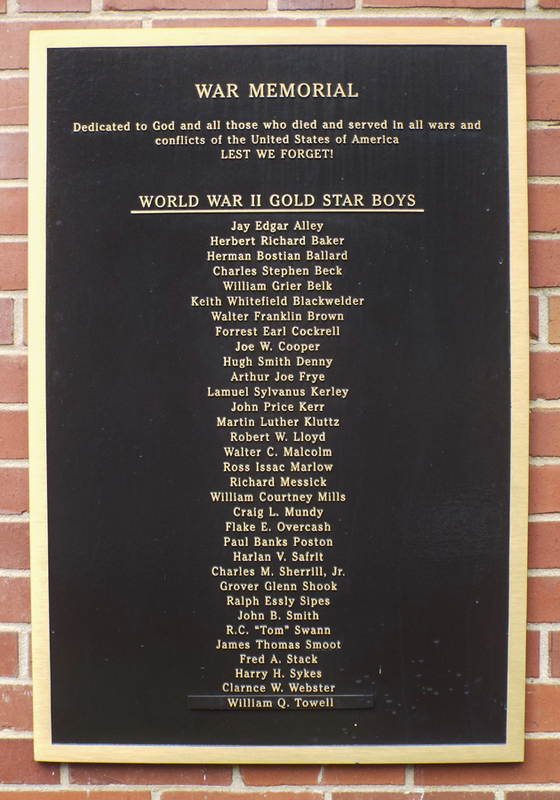 This memorial plaque is dedicated to Mooresville men who died in World War Two. The unadorned bronze plaque is two feet wide and three feet tall with a black background. It is attached to the outside wall of the Mooresville War Memorial Center. WAR MEMORIAL / DEDICATED TO GOD AND ALL THOSE WHO DIED AND SERVED IN ALL WARS AND / CONFLICTS OF THE UNITED STATES OF AMERICA / LEAST WE FORGET! 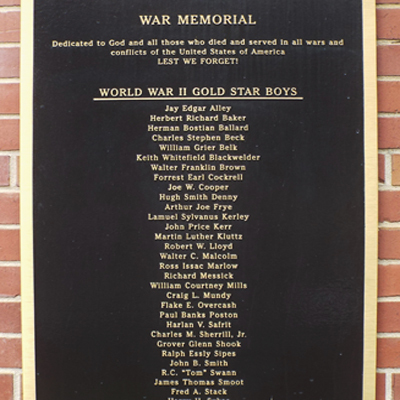 The memorial plaque is attached to the outside wall, left of the entrance, of the Mooresville War Memorial Center, located at 220 North Maple St., Mooresville, NC. Right of the entrance is a memorial to Captain Reid Morrison and the Mooresville Mills World War II Honor Roll. The Memorial Center is surrounded by well-maintained lawn, trees and seasonal greenery.